Patience, warmer soil temperature and correct lawn management will solve many spring lawn problems. 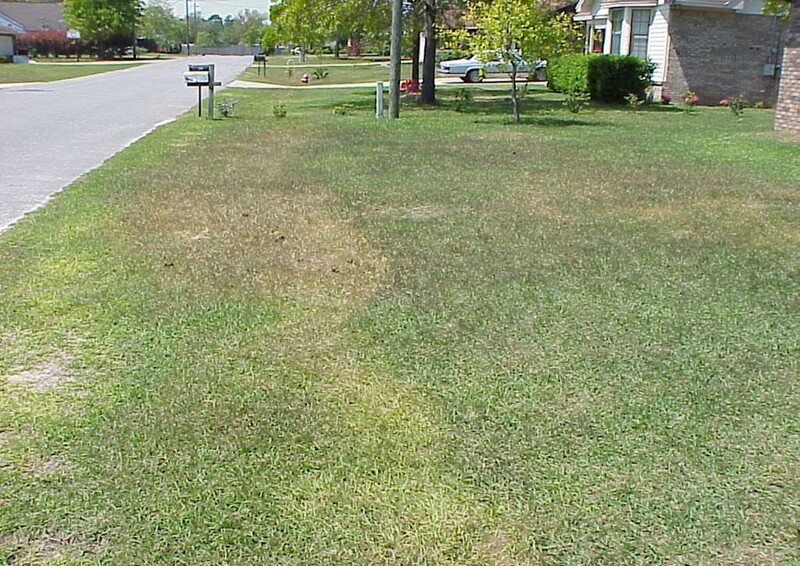 Many spring dead spots in lawns are caused by something that happened the previous growing season or winter. For example, a late application of a high-nitrogen fertilizer can decrease winter survival. It’s best to not fertilize our lawns after early September. An insect or disease problem during fall many times goes unseen as the grass is beginning to go dormant. The following spring, as the lawn begins to green up, evidence of a fall pest is clearly visible by brown dead, grass. The pest may not be present or active during spring. Poor maintenance practices may be to blame for spring dead spots. Over-watering, shallow watering (watering frequently for short periods), mowing too low, too much fertilizer and herbicide injury can result in poor lawn performance come springtime. 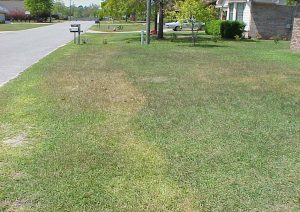 Regardless of cause, problem areas within lawns are slow to recover during spring due to frequent cool night temperatures. Frequent cool nights keep the root zone cool. Cool soil temperature doesn’t allow rapid root regeneration in spring, which inhibits top growth in your lawn. Cool soil also decreases availability of some needed nutrients. For example, poor availability of iron because of cool soil is a common cause for bright yellow areas within lawns, especially in centipedegrass. Cool soil also decreases availability of phosphorus and potassium, which can result in reddish-purple grass blades, intermingled throughout the yard. As soil temperature increases, availability of nutrients improves and the yellow and purple areas turn green. Have patience with your lawn and follow good maintenance practices this spring. Provide ½ to 1 inch of water when the grass shows signs of wilt. Fertilize and lime based on the results of a reliable soil test. And, mow at a high setting. Good lawn maintenance info is provided at the YourFloridaLawn website. Consistently warmer nights will allow the soil temperature to warm, which will improve turf root growth, nutrient availability and lawn recovery. During many years in North Florida, it’s well into the month of May before our lawns begin to recover. If the lawn has not made a comeback by late spring or early summer, it may be time to consider reworking and replanting the dead areas or maybe consider replacing them with something other than grass, if practical.